They're tough to come by, but once you find them, you're good to go ... and go and go and go. What are we talking about? Gym bag essentials. Finding products that work for you is key to staying on track toward achieving your goals - whether they be completing your first race, staying healthy through the playoffs or something as commonplace as staying protected while you and your family exercise outdoors. Part of the reason Mission appeals to so many different people is because our products address various components of the training process. They help you protect, perform, and rehab. Depending on your specific needs, you can browse our products by any one of those three categories. For protection, we've chosen a fan favorite: the SPF 30+ No Sting Face Stick. In fact, just a couple weeks ago, we had a Mission user check in over Twitter from the Cayman Islands. She is an Ironman triathlete and runner and while training under the tropical sun, she's choosing Mission. She's in good company too. Sergio Garcia - our resident golfer - uses it every time he's out on the green. So, if you're putting in miles outside, or just spending time in the sun, our sun (protection) products are athlete approved, and available in varying SPFs and applications. For performance, we went with a lesser known product, with an equally impressive fan following. 5 Hour Anti-Chafe Creme. If you missed our blog post on Sarah Haskins from earlier this year, she candidly gushes about how Anti Chafe has saved her from saddle sores and blister hickeys (on her way to World Championships and Olympic Games, of course!). If you're running, biking, swimming, and everything in between, Mission's Anti-Chafe stands up to your crossover ways. This holiday season, we're doing our best to make finding gym bag essentials easy. All of the products listed above are featured in gift baskets designed by our superstar athletes themselves (and offered at a great value!). To take a look at who likes what, you can browse all of the kits here. And, if you're in love with a product and want to share where you've been using it, shout us a holler. It's always fun to hear from fellow athletes on a Mission. The season of giving is well underway. Like us, you're on the hunt for great products and great value. Look no further. We recently teamed up with five of our athlete partners - Serena Williams, David Wright, Sarah Haskins, Sergio Garcia and Georges St. Pierre - to create customized holiday kits. Each of them hand-picked a collection of their favorite (and signature) products that they think will be perfect for the athletes in your family. 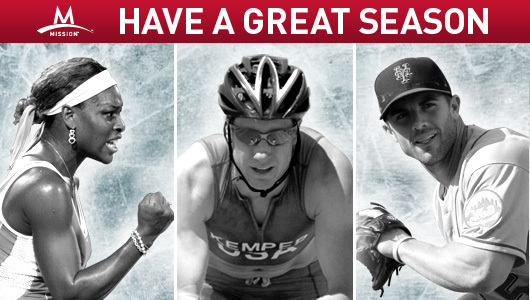 Choose from kits for tennis players, baseballers, triathletes, golfers and UFC hopefuls (or those who train like them)! Just a hint, they make great stocking stuffers! Beginning today, and running through Christmas, all kits are just $30.00 (over $10 in savings) with free shipping. To peruse the selection, click here! Everyone’s on a mission. Regardless of whether tomorrow’s goal is winning the US Open (here’s lookin’ at you, Serena) or getting up after a taxing workout or a day of heavy lifting, the ability to bounce back is essential. Just ask Mission Athletecare partner and Met’s 3rd baseman, David Wright who attests, “good day or bad day, you have to be able to rebound and rebound quickly.” Even though most of us are not accustomed to the seven-day workweek of athletes like David and Serena, we are familiar with the idea of a no-days-off attitude. If our goal is something worth pursuing, we should be pursuing it non-stop. Keeping the mind sharp to achieve that goal is one thing. Keeping the body prime for the daily grind of making it happen is another. 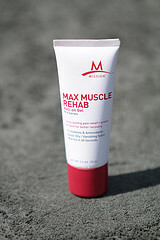 That’s where Mission’s Max Muscle Rehab steps in. As part of the line of Mission Athletecare products, it was specifically engineered to enhance performance and rehab for training and competition. There is no need for ice baths or heating pads; just apply and get back after it. 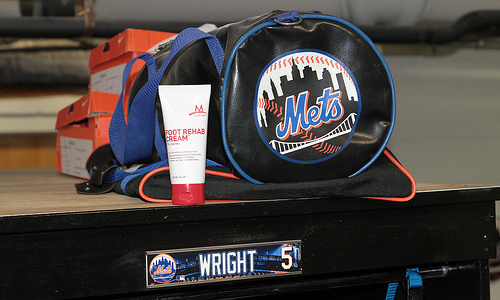 Max Muscle Rehab helps David “jump outta bed” to suit up for the Mets. And, Serena Williams, who can name a laundry list of body parts that are aching after training, uses it at the end of the day for “instant results.” We all love those and we all have to get up tomorrow. Here’s to a speedy recovery. M Foundations Presents Inaugural "Gold M Award"
On a balmy night in New York, the M Foundation, in partnership with Mission Athletecare™, Modell's Sporting Goods and the David Wright Foundation presented the inaugural $20,000 "Gold M Award" to high school senior Mitch Arnold, from Fort Atkinson, WI. Launched in September 2010, The M Foundation is a revolutionary non-profit organization that inspires young athletes to lead healthy lifestyles and to perform their best both within and outside the competitive arena – through activation and awards programs – most notably, The M Awards. The M Awards, a national scholarship program which are championed by the M Foundation's world renowned athletes and spotlight "Athletes on a Mission" everywhere, identifies high school athletes who are exemplary role models in their communities. In its first year (2010-2011 academic year), the M Foundation recognized over 40 high school student athletes with Bronze and Silver as well as our one overall Gold award winner. "We are extremely proud to present Mitch with the first ever Gold M Award for his exceptional leadership both on and off the field, and for his outstanding commitment to give back to children around the world who share his love and passion for soccer," said Cathy Cercena, Executive Director of the M Foundation. "Mitch is a leader, a role model and a shining example of what it means to be an "Athlete on a Mission." 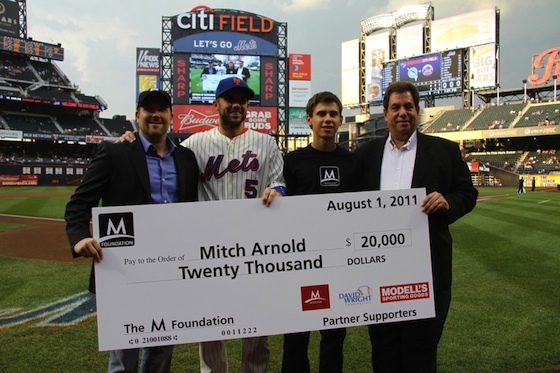 Arnold was presented with a $20,000 check – $10,000 college scholarship, $10,000 donation to charity – during an on-field event at Citi Field on Monday, August 1st with New York Mets All-Star David Wright, President, Mission Athletecare Founder and President Josh Shaw and CEO of Modell's Sporting Goods Mitchell Modell. "The true meaning of an athlete is not only to perform on the field but to leverage those abilities in the community as well," said David Wright. "Mitch embodies everything an athlete should aspire to be and we're honored to present him with the inaugural Gold M Award so he can continue to educate and inspire other student athletes across the world." Arnold's mission mirrors that of the M Foundation in that he seeks to educate and inspire. In October 2006 he created a foundation called "Peace Is the Goal," an organization created to spread goodwill throughout the world by way of soccer. By supplying children in need with new soccer equipment, Arnold is giving kids a positive outlet, providing physical education, team-building and morale-boosting activities. Since the inception of "Peace Is the Goal," Arnold has completed 106 projects which have led to the shipment of nearly $35,000 worth of soccer equipment and has impacted more than 15,000 children in 53 countries including Afghanistan, Ethiopia, Kosovo, Uganda, the United Arab Emirates, Vietnam and the United States. Arnold added, "I want to thank the M Foundation for choosing me as the inaugural Gold M Award winner. I feel blessed to be recognized and honored by such a phenomenal entity and by athletes whom I've admired throughout my entire life." To learn more about The M Awards or to nominate a student-athlete, visit www.theMawards.org or register at www.berecruited.com. For more information about the mission and work of The M Foundation, visit www.theMfoundation.org. Do you have a good story about a young athlete in your community making a difference? Leave a comment below! 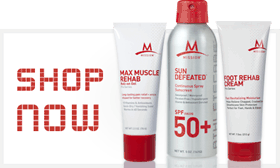 Mission Athletecare’s Suncare products are developed by leading scientists, and field tested by some of world's top athletes, for people with active outdoor lifestyles. Whether you are hitting clean-up or swimming with your kids, our Sun Defeated™ Continuous Spray and No-Sting Facestick products are going to help you better protect your skin and perform at your best. Plus, it’s hard to hit a 98 mph fastball with sunscreen stinging your eyes; just ask MLB All-Star and Mission Partner David Wright. “You try different sunscreens, and they all sweat into your eyes and sting, and that’s a distraction. Mission’s Suncare products are truly sweatproof and waterproof, and this is one of those things that can help give you that little edge when you are out there on the field. Plus, whether you are in Little League, the Minor Leagues or the Big Leagues, protecting your skin from the sun is of the utmost importance." Skin protection is not only important, but often overlooked by athletes. A recent study of college athletes suggests that as much as 85% of athletes who compete in the sun do not use any form of sun protection. Our Suncare products boast broad spectrum UVA/UVB protection, are loaded with vitamins and antioxidants, and are 100% free of parabens. Learn more about our Suncare product line.